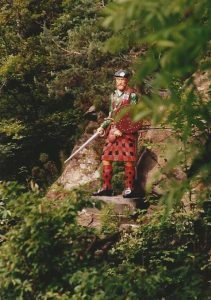 This model of the kilted Scottish hero is made of polychrome carved wood and was carved by Arnold Smith The statue of Rob Roy was unveiled in 1991, so has been in place come rain or shine for the last 25 years. Construction firm, Diack and MacAuley, is conducting on-going repair work on the historic Rob Roy Bridge, which is adjacent to the statue. The company has donated the use of a mobile crane to allow the Rob Roy Preservation Trust committee to remove it for a full evaluation.